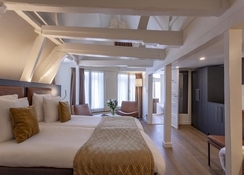 Hotel Avenue is an iconic hotel consisting of a sequence of nine monumental buildings, with the oldest dating back to the 17th century. 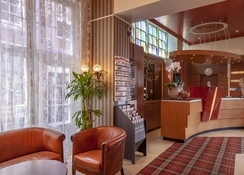 This comfortable 3-star hotel offers 82 guestrooms to its guests. 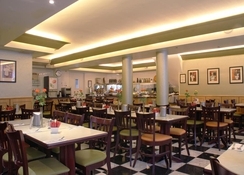 The hotel’s café – the St. Jacobsstreet Café, is among the most famous ones in Amsterdam. 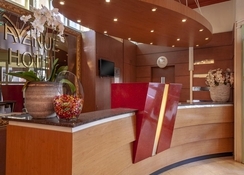 The receptionists at the front desk assist you in exploring the city. They provide useful tips on which public transport takes you to certain attractions; which restaurant is worth visiting, etc. The day starts with a generous breakfast buffet in the breakfast room. Guests have unlimited use of this facility. They can also relax at the St. Jacobstreet Café enjoying fresh draught beer or other spirits or beverage after a long tiring day. The café is open from 5pm to midnight. Public areas are non-smoking, except from bar. 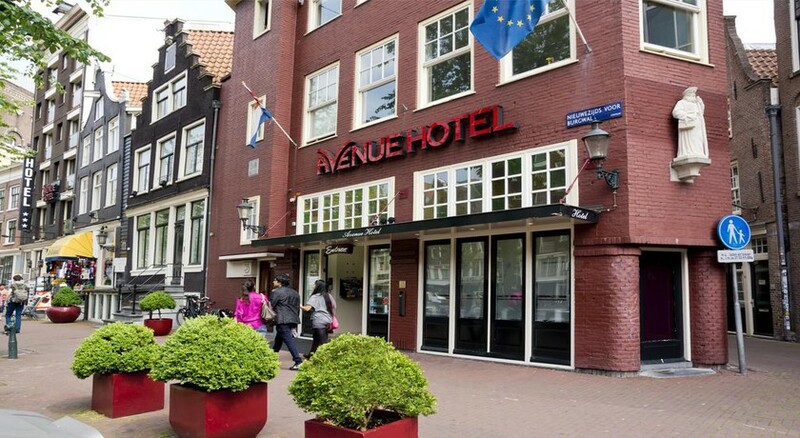 With its central position the Hotel Avenue functions as a base for you to explore Amsterdam. Most of the attractions in Amsterdam are within walking distance, or can be easily reached by rental bike, by water taxi or by public transport. Head over to the Magna Plaza, which houses several high end boutiques. Or view the wax statues at Madame Tussauds. Navigate through the canals of Amsterdam or take an aromatic stroll along the colourful stands on the Flower market. The Amsterdam Airport is about 16km from the hotel. Every single room showcases a unique interior design. The 82 guestrooms at Hotel Avenue are categorised as single room, twin and double room, triple room and quadruple room. Most of the guestrooms are non-smoking. You will find facilities such as air conditioning, TV with satellite, en suite with bath amenities, hairdryer, Wi-Fi internet, balcony/terrace, telephone and safe deposit box—you might have to locally pay to use some of the facilities in the room. Most of the rooms have twin beds (joined or separate) and you can request for an extra bed or crib at the front desk. Housekeeping is available daily. Hotel Avenue serves a full English breakfast. The St. Jacobs street Café offers a range of wines, spirits and beverages. 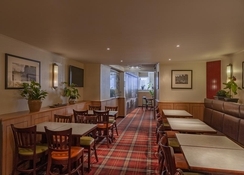 There are several restaurants, bars and clubs within close proximity to the hotel. A super market is not too far from the property. Amsterdam is full of excitement throughout the day and night! Located in the heart of the city, Hotel Avenue, isn’t too far from the best nightclubs, bars, restaurants and discotheques. Magna plaza is only a few hundred metres from the hotel. Madame Tussauds is about 600m from the hotel. Stayed for 2 nights at start of December, 3rd floor apartment, great location, in the centre ( but not central where it’s busy if that makes sense. Was diss appointed with the beds, we had 2 singles as a double which not too bad, but the sheets had few marks on, we split the beds as my phone slipped down in between, and the durt and dust was a disgusting. The bathroom was a huge wet room , nice and clean with the towels, we only had breakfast once, but can’t fault it really, it’s a typical breakfast buffet and everything I had was fine. Overall for a short stay I would recommend, anything longer than 1/2 nights I would advise something a level above. you get what you pay for. Me and my girlfriend decided to stay at the hotel only because we knew we would spend most of our time outdoors. I was really disappointed with the shower though, we did not expect a walk in shower and there was points where the hot water would cut out temporarily. Other than that I don't remember any other flaws. Rooms were small dated pokey and looked unclean. We requested to change our room on day one because it was way too small! The hotel staff very kindly obliged and moved us into another room which was just as small. We decided to stay in this room for the duration of the holiday because we didn't want the further hassle of moving again!